2-James McHugh was born on 20 Jun 1861, died on 26 Sep 1914 in 54 Garfield Street, Launceston, Tasmania at age 53, and was buried in Carr Villa Cemetery, Launceston, Tasmania. 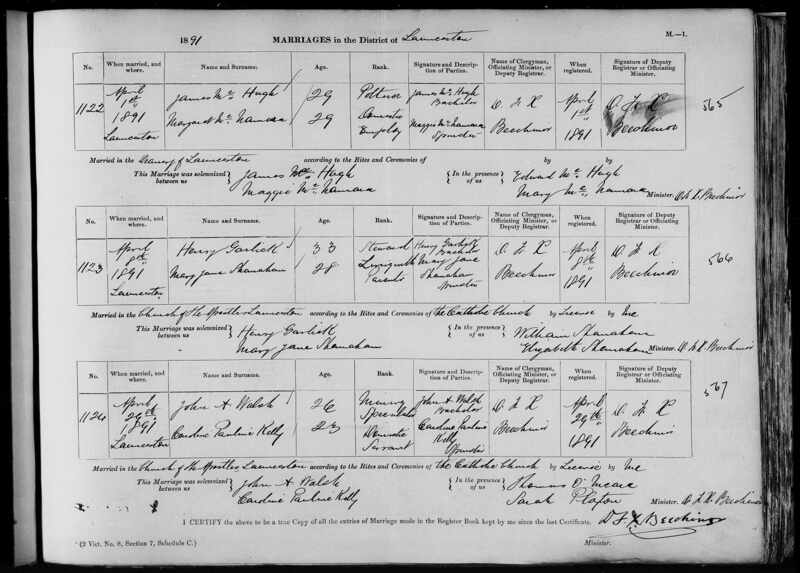 James married Margaret (Maggie) McNamara, daughter of James McNamara and Bridget Roach, on 1 Apr 1891 in Launceston. Margaret was born about 1862, died on 3 Aug 1930 in Home, 54 Garfield Street, Launceston, Tasmania aged about 68, and was buried on 4 Aug 1930 in Carr Villa Cemetery, Launceston, Tasmania. McHUGH.--On the 3rd August, at her residence, 54 Garfield-street, Margaret, relict of the late James McHugh, and second daughter of the late James and Bridget McNamara, of Deloraine, aged 68 years. R.I.P. 1-James McNamara. James married Bridget Roach in 1862 in Deloraine, Tasmania. They had five children: Tom, Mary, Margaret, Ellen and John. 2-Mary McNamara was born about 1857 and died on 19 May 1929 in sisters home, 54 Garfield Street, Launceston aged about 72. IN MEMORIAM McNAMARA--In loving memory of our dear sister, Mary McNamara, who departed this life May 19, 1929. "At rest." Sleep on, dear sister, so good and true, No sister on earth was better than you, Life was desired, but God did see, Eternal rest was better for thee. -Inserted by her loving sister and brothers, M. McHugh and G. and J. McNamara. 2-Margaret McNamara was born about 1862, died on 3 Aug 1930 in Home, 54 Garfield Street, Launceston, Tasmania aged about 68, and was buried on 4 Aug 1930 in Carr Villa Cemetery, Launceston, Tasmania. Another name for Margaret was Maggie. McHUGH-In loving memory of my dear sisters, Mary McNamara and Margaret McHugh, who passed away on the 3rd August, 1930. This is a day of remembrance, One I will never forget. A day I will always remember, When the rest of the world forgets. -Inserted by their loving brother, John. McHUGH.-Friends are respectfully invited to follow the remains of the late Mrs. Margaret McHugh to the place of interment, Carr Villa Cemetery. The funeral is appointed to leave her late residence, 54 Garfield street, this afternoon, at 2.30.-ARTHUR DOOLAN, Undertaker, Wellington and Balfour streets and 257 Charles-street. McHUGH--In loving remembrance of our dear sisters, Margaret, passed away 3rd August 1930; also Mary, McNamara, passed away 19th. May 1929. As we loved you, so we miss you, Sweet remembrance, fond and true; As the years roll by, dear sisters, We will always think of you. -Inserted by their loving brothers, Tom and John McNamara. 2-Ellen McNamara was born on 5 May 1862 in Deloraine, Tasmania.